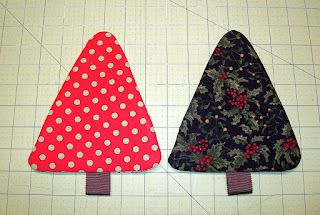 Welcome to my post for the October Ho Ho Ho and On We Sew linky party - I'm glad you could make it! 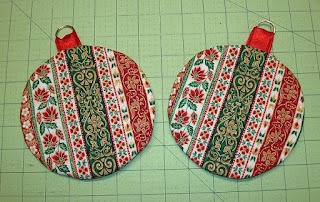 Each month Paula at Mud, Pies and Pins, and Fiona at Celtic Thistle Stitches, host a linky party where we can post our Christmas ideas and finishes - it's a great way to get Christmas prep inspiration and ideas throughout the year, and a kick in the behind to get busy if we need it :D At the end of the post you'll find a link to this month's linky - everyone who posts a project to it has a chance to win (you don't have to comment to enter). This month's giveaway is provided by Sarah at duck egg threads --- the prize is 3 X F8's of seasonal Liberty fabric - check it out - so gorgeous! 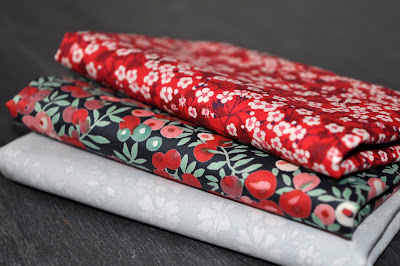 DELICIOUS Liberty fabrics - OH MY! 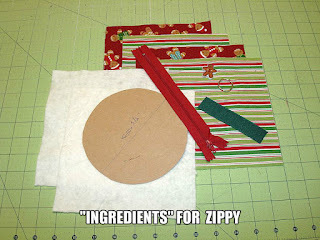 I'm not doing a detailed tutorial of how to make a zippy - there are tons of those on the internet. 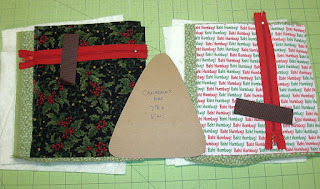 Rather, my tutorial will explain my method of doing the shapes in an easy way that has a "fudge factor" built in. 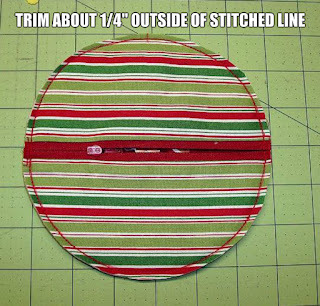 Certainly try to be accurate, but it's easier to stitch on a drawn pattern than it is to cut out curves and try to align them properly for stitching. For me, anyways! For my project, I traced a small plate onto cardboard and cut it out. Mine measured 5 3/4" in diameter . 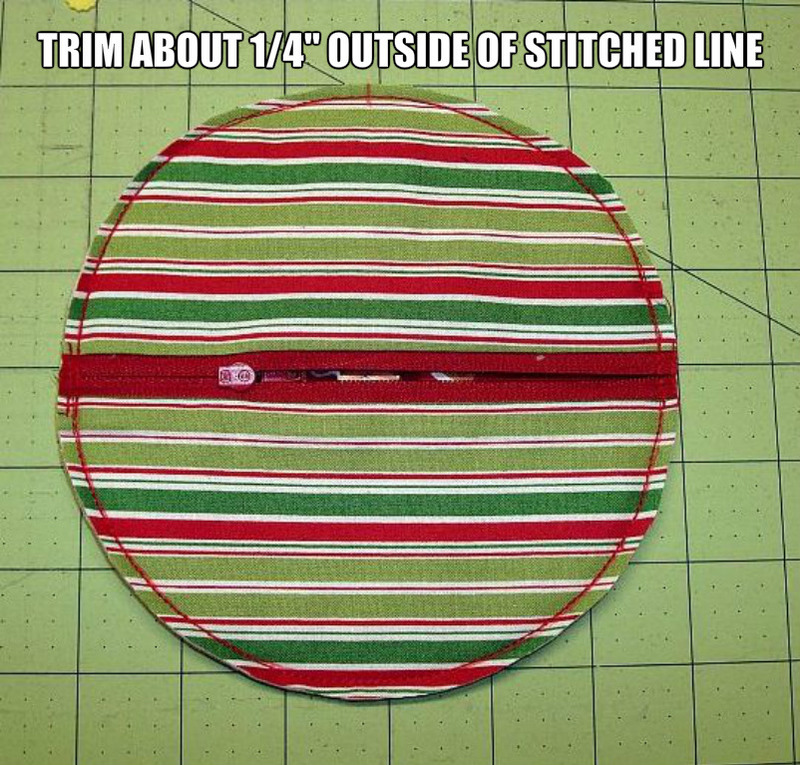 I drew a line through the center of the template for aid in placement on the fabric - my bag will have a center zipper, so that's where I drew the line. I add about 1.5" "fudge factor" to my cutting measurements, so I cut out 7" squares of fabric, lining and batting (2 of each). 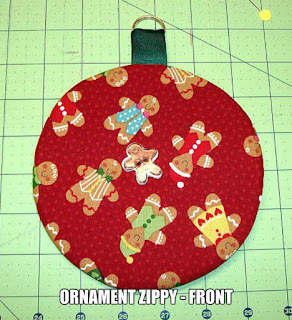 I also used an 8" zipper, a 3" piece of ribbon and 1" split ring for the "hanger", and a button to embellish the front (optional). 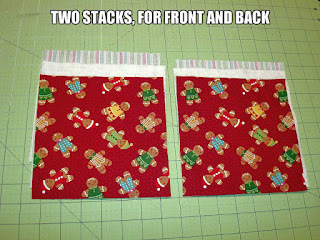 Make 2 stacks - one for the front, one for the back --- lining right side down, batting, outer fabric right side up. 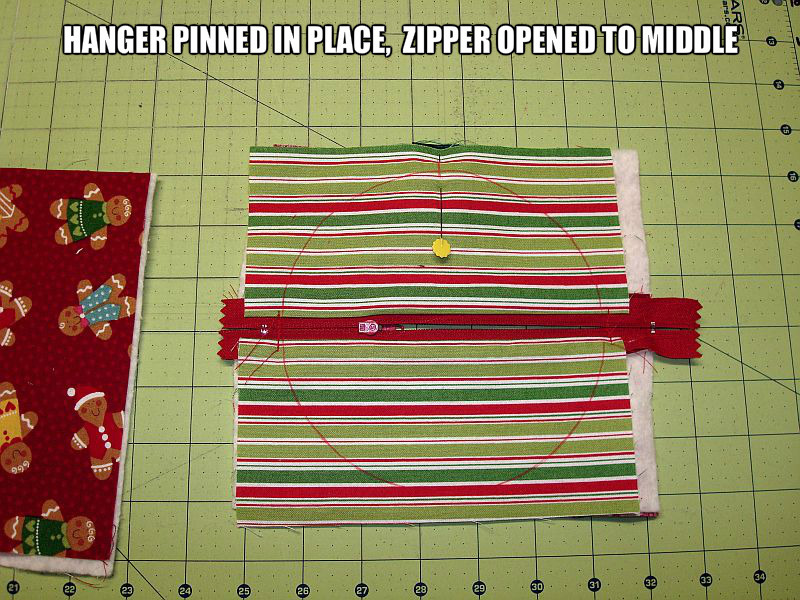 Decide where your zipper will be placed - front or back, center or off center, horizontally or vertically. 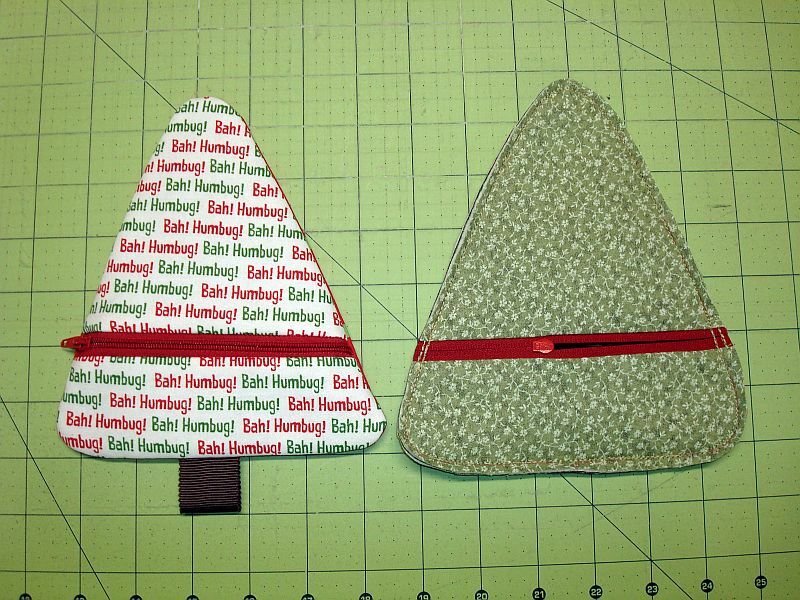 Your shape choice will determine where the zipper would look best - mine will be on the back, centered horizontally. Slice one of the stacks where the zipper will be installed. 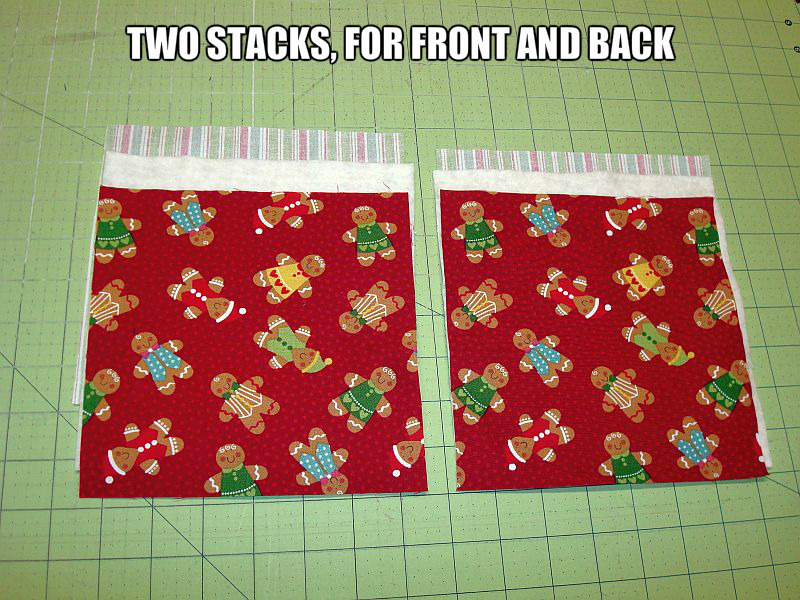 Be careful with directional fabrics - make sure they're oriented properly. 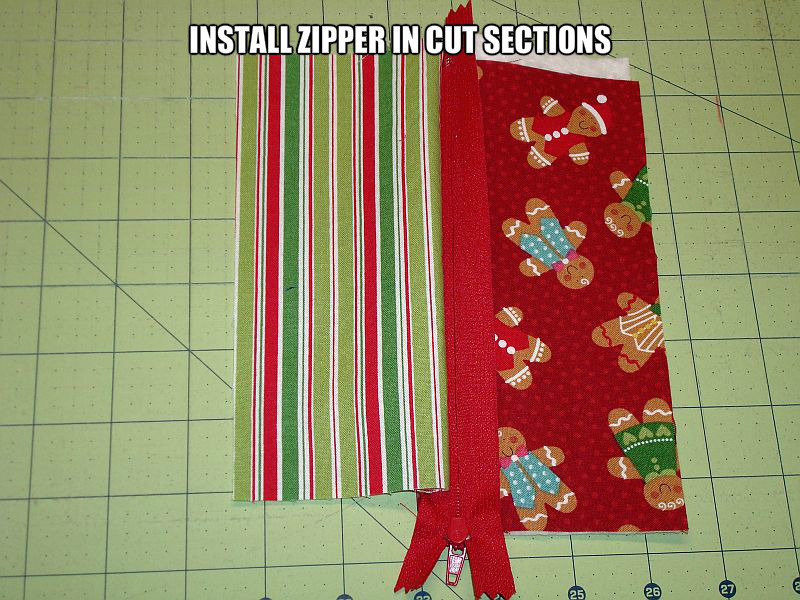 Install zipper as normal, in the section you cut in half. 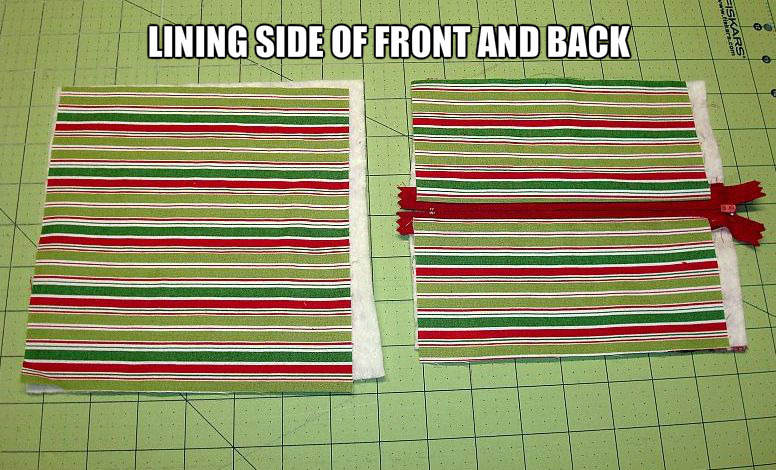 Again, make sure directional fabrics are oriented properly. 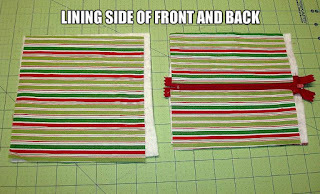 This photo shows the zipper installed on one of the two halves for the back. 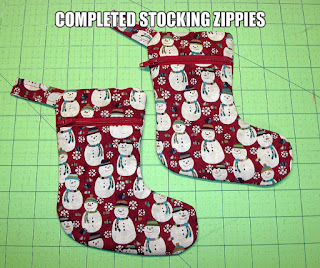 Gettin' there! 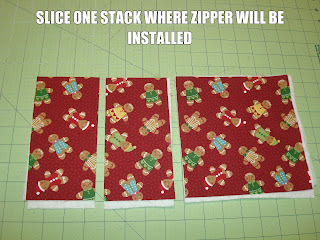 Stack the 2 pieces RST, with the zipper on top. 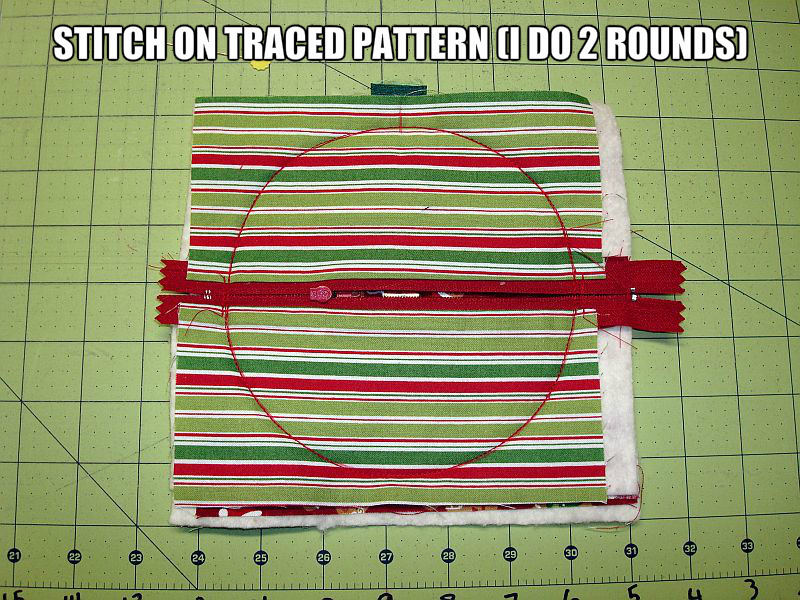 Trace around the template - since my zipper is centered, I used the center line on my template, and ran it along the center of the zipper (don't forget to check fabric orientation). 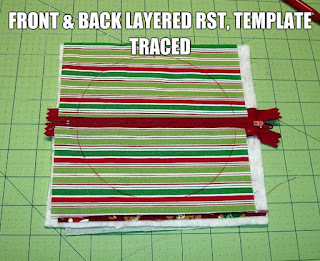 The traced line will be your *stitching* line. 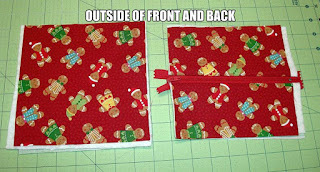 I wanted the "hanger" (tab) to be centered at the top of the pouch, with the zipper (in the back) centered horizontally. 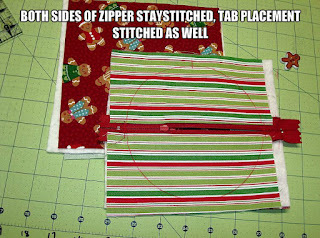 I marked staystitching lines at the location for the tab (top center), and just outside the stitching line on either end of the zipper. 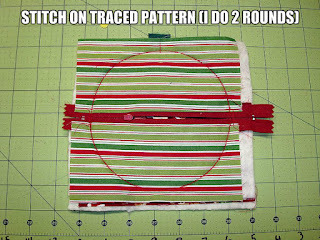 Those last 2 lines show me where to staystitch to keep the zipper from opening before its time :D This photo shows the staystitching on either end of the zipper, and the tab placement top center. 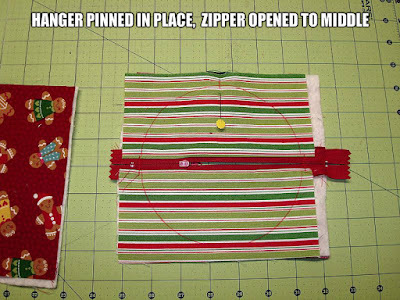 Pin the hanger in place and - very important - open the zipper to the center of the bag. 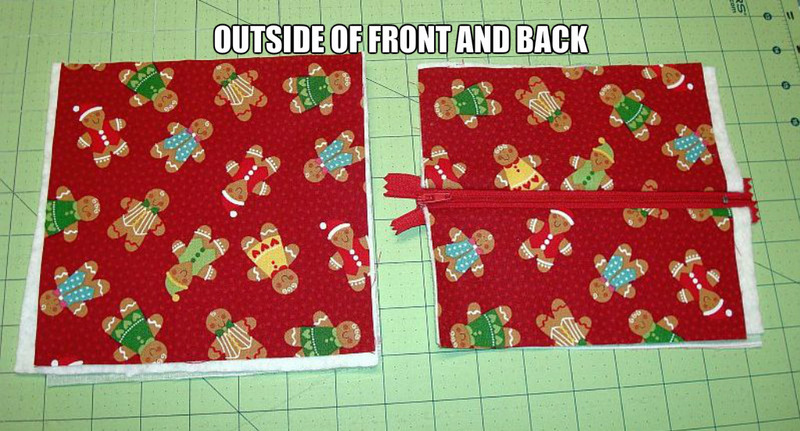 If you've made pouches before you'll know that rule! 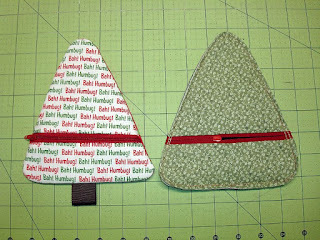 I hope my photos and explanation for this technique are clear enough - this is a simple project - I finished those 2 Christmas tree pouches 30 minutes after I took the first picture. 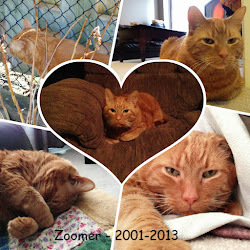 Please ask if I've missed anything, or if anything is unclear! 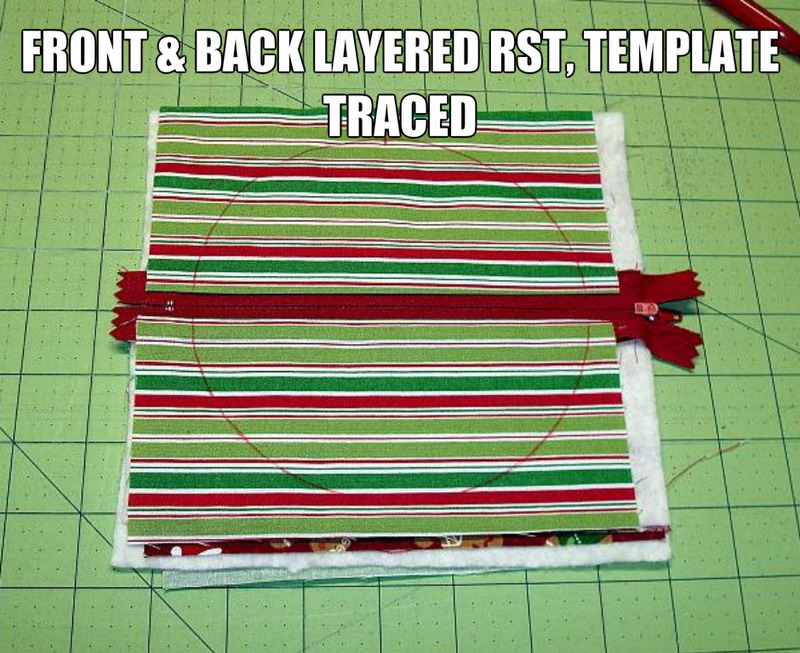 I drafted my templates based on images I found online (or based on a plate, HAHA) - they're so simple that even I could do most of them freehand. 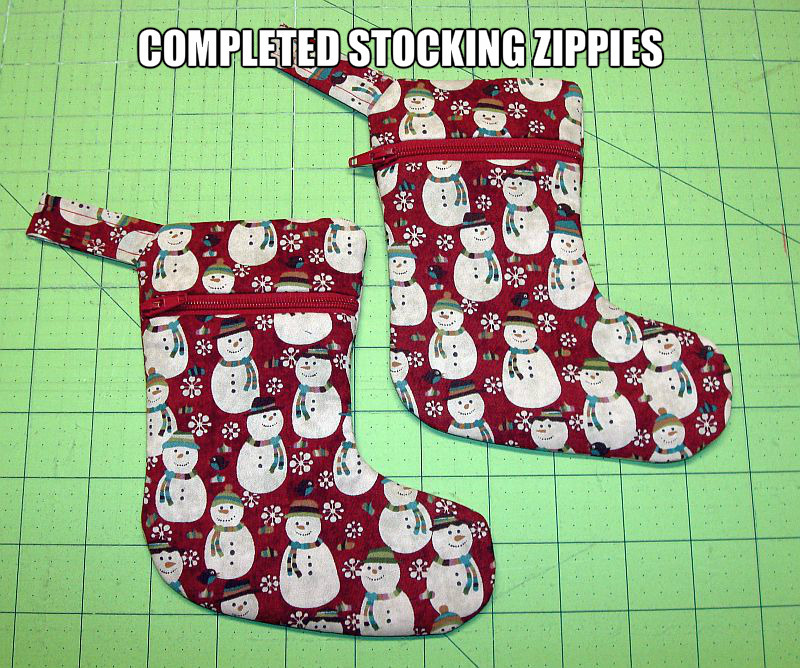 You can get inspiration by image searching, for example (and without the "s) "colouring book pages Christmas" or "simple line drawings Christmas". Well for pity's sake, aren't you the clever cookie!!!! That's fabulous! I would never have thought of that. Great instructions Sandra, even I could follow them, and really, really cute zippies all! What a great idea to add the 'fudge factor'!!! 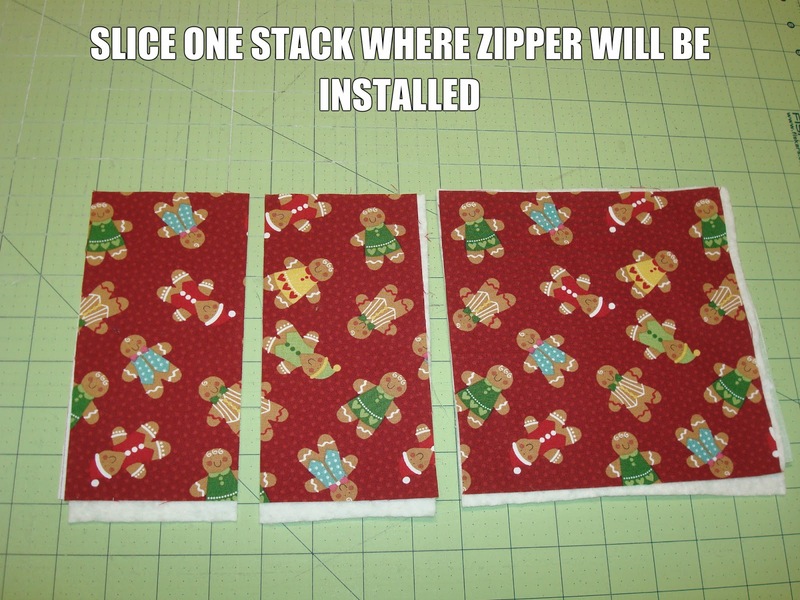 That eliminates the chance of sewing too close to either the lining or main fabric - or missing one altogether. 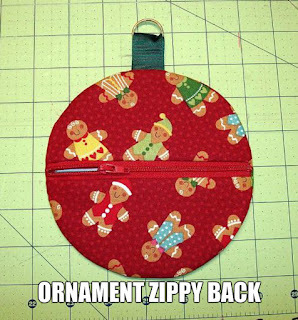 And I just LOVE your ornament zippies. 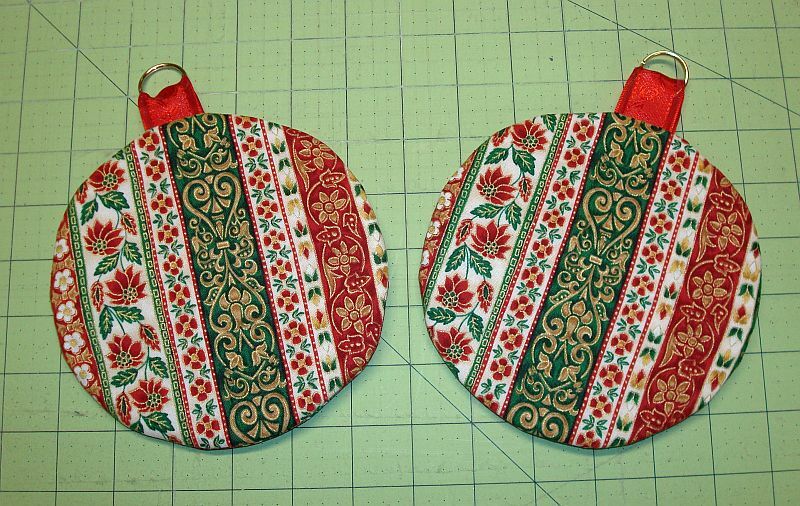 How cool would they be, hanging on the tree with a surprise in each. 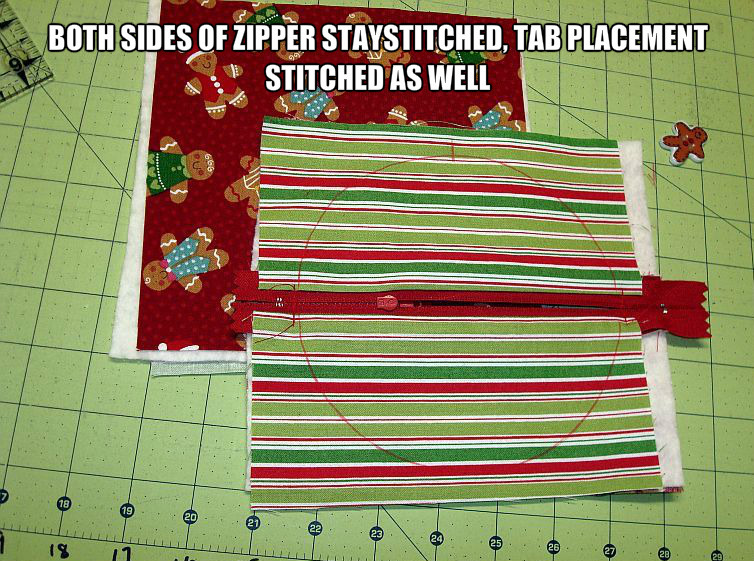 Ha, ha... now you've added more sewing to my Christmas list. I HAVE to make one for all the little kids, and maybe the big kids if time permits. What cute zippies, and a great tutorial too, thank you for sharing. 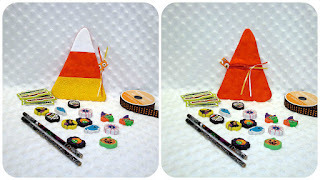 These really are such a great idea and they are ever so versatile. 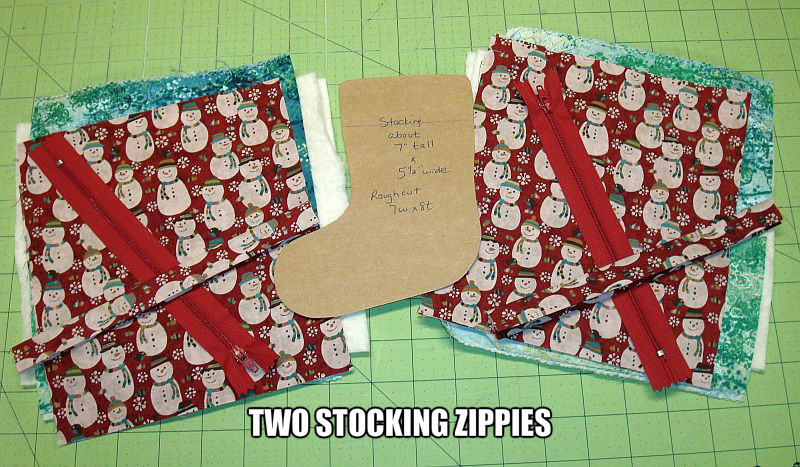 I will defintiely have to give these a try. 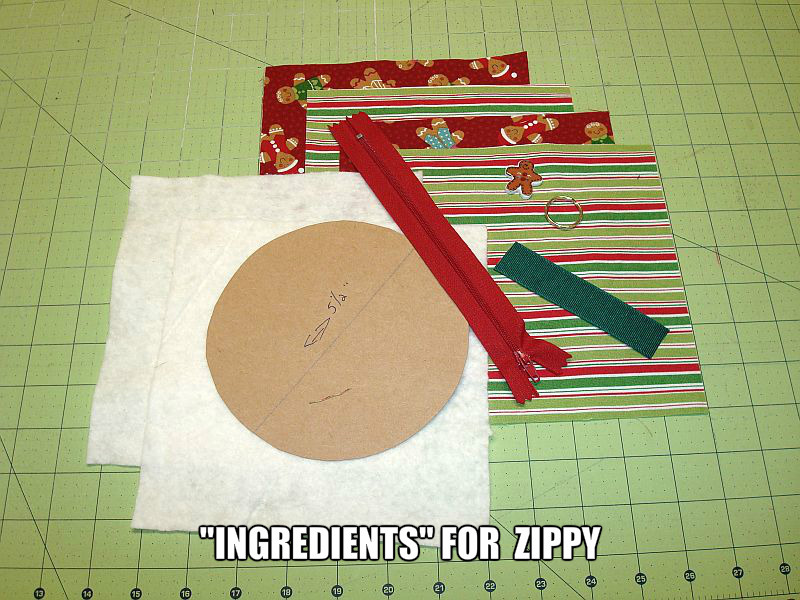 I might, believe it or not, attempt to make a zippered pouch because this is a really clear and great tutorial. Brava! Brava! 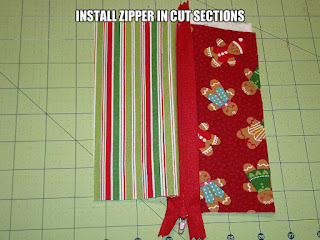 These are such a good idea, I've never seen them around the internet before so thank you, and especially for the fudging tips, I always like ways to fudge especially if there's a scary zip involved! The Christmas tree ones are definitely my favourite and I'm going to have to try and get some made now. 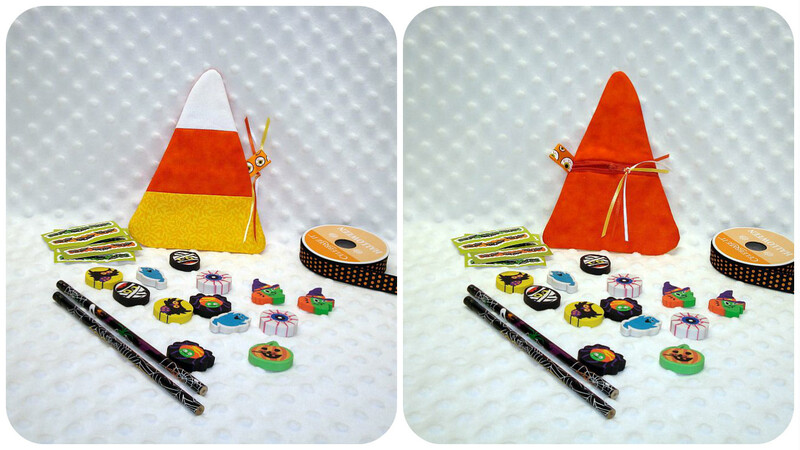 Love all the fun shapes - would never have thought of making zipped pouches like this!